Everything you wanted to know about Windshield Repairs, but were afraid to ask. Windshield Repair is a process that uses modern technology to repair rather than replace a damaged windshield. It saves money by preventing the need for a costly replacement. It does not affect the integrity of the original factory seal because the glass is never removed. You also keep your original quality glass. The repair provides a strong bond that prevents further cracks and improves the cosmetic appearance. 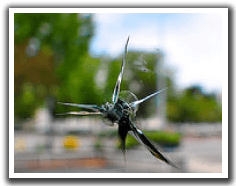 Stone damage or "rock chips" up to the size of a quarter. A rock chip is usually round or star shaped and may have lines radiating from the center. If your rock chip appears to only be a white speck, it could be a non-repairable nick in the glass; A Don's Mobile Glass specialist can diagnose it for you. Will my rock chip ever crack? The possibility of your rock chip forming into a crack is greater now if not repaired. If you repair the rock chip before it turns into a crack, it will not spread under normal conditions. If not repaired, a rock chip could form a crack if there is a drastic change in temperature ( i.e., washing your car on a very hot day with cold water) and/or if internal or external stress occurs to the windshield. Best results are obtained if the repair is done before the damaged area is contaminated from washing or inclement weather. How is a damaged windshield repaired? By injecting a specially formulated resin into the area. When the damaged area has been completely filled, it is exposed to an ultraviolet light that cures the resin. This restores 100% of the structural integrity and, in most cases, most of the clarity within the damaged area. Can a chip spread while it's being fixed? Industry statistics say that chances of this happening are only 1 in 5,000. Because DMG technicians are NGA certified and work under controlled conditions, we can assure you that the risk is minimal. Do I need to bring in my vehicle or can this be done at my place? Don's Mobile Glass offers in-shop and mobile service; the process is the same whether you bring it to us, or if we come to you. How will the windshield look after the repair? When looking through the windshield, your vision should not be impaired. If it is, then the windshield should be replaced. In most cases, the damaged area should become noticeably clearer after being repaired; clarity though, is dependent on the size, age, amount of glass missing from the center, and the quantity of fragmented glass within the break. What about my auto insurance? Most insurance companies consider windshield repair a No Fault claim and it will not affect your insurance rate. Windshield repair is covered by the comprehensive portion of an individual's insurance policy. All major insurance companies encourage and have recognized the benefits of windshield repair. Most insurance companies will waive the deductible requirement if a windshield is repaired rather than replaced, reducing your cost to zero! Call Don's Mobile Glass with your policy number handy, we will make the call for you to confirm the coverage and details. Lets us handle the insurance process for you, with as little inconvenience to you as possible. I think all the companies should have mobile service, and changing the windshield through the insurance company wouldn't it effect the insurance rate. I like that you brought up that many insurance companies consider a windshield repair a No-fault claim, so your insurance rate won't be affected. I think some people worry that it may be too expensive or that their rates will go up so they're hesitant to get it repaired. In some cases though, it can be dangerous to not get it repaired, so it's always worth it get it checked out and fixed.